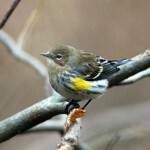 Song is unmusical jumble of harsh, chattering clucks, rattles, squawks, and clear whistles. 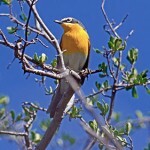 Male usually sings from conspicuous perch. Description: Long-tailed and thick-billed. 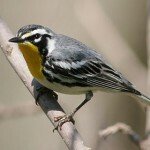 Olive-brown above; bright yellow throat and breast; white belly and undertail coverts; white spectacles; white whisker stripe; black eye patch. Lores are black in males, gray in females. Behavior: During display flight, male hovers with legs dangling. Habitat: Ravine or streamside thickets with small trees and tall shrubs, forest edges, dense stands of tree saplings, and clumps of shrubs in overgrazed pastures. 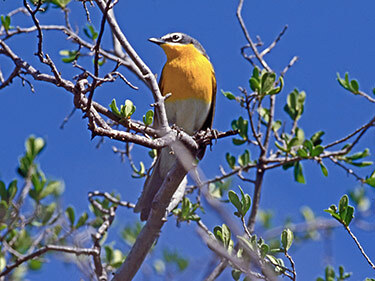 Fun Facts: Unlike most warblers, the Yellow-breasted Chat has been known to mimic the calls of other birds.